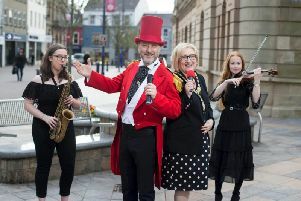 Derry man and member of Simon Cowell band, ‘Jack Pack,’ Martin McCafferty, will perform in Derry for the first time with the rest of the group in the city this Sunday. Martin (33) and the three other ‘Jack Pack’ members will take to the stage in Silver Street, Shipquay Street and will perform tracks from the band’s self-titled debut album. Martin is from Kingsfort Park in Derry and is a former pupil of St. Patrick’s P.S., Pennyburn, St. Brigid’s College and St. Columb’s College. “There’s no better place to be at Christmas time in my opinion, but then again I’m biased,” he laughed. Martin has been singing and performing for over 20 years. Even when he was working full-time for a car magazine in Belfast he would have spent many nights performing hits by Frank Sinatra and Dean Martin in places like Cafe Vaudeville. Music and singing was always something Martin was familiar with growing up. Martin’s mother, Eithne and his three older sisters all sang in the local Colmcille Choir. Martin’s father, Michael, was also a regular performer in Derry and would have played alongside many of the show bands. “It’s amazing waking up every morning knowing that I am doing something that I absolutely love,” he declared. ‘Jack Pack’ made it to the final of Britain’s Got Talent a few years ago and since that time have returned to perform live on the show. The other members of the band are Sean Ryder-Wolf, Alfie Palmer and Andrew Bourn and they all said they are looking forward to Sunday’s concert. “It’s such a pleasure for us to go to Martin’s home town to perform and see all of his family,” said the band. “We always get such a warm reception in Northern Ireland,” they added. The concert starts at 8:30 p.m. on Sunday and tickets cost £22.